Hierarchies of understanding (HoU) [1-5] facilitate discussion about human learning (see Figure 1). 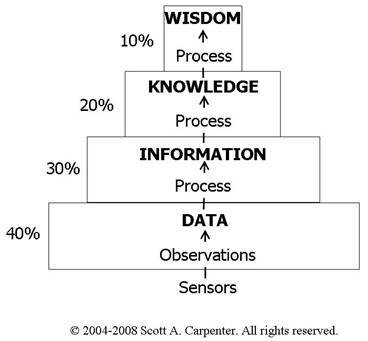 Cleveland , Ackoff , and Bellinger  proposed bottom-up HoU that begin with data and end with wisdom. 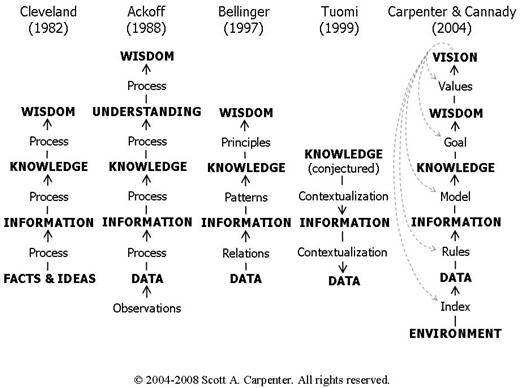 Tuomi  proposed a top-down HoU in which knowledge is first conjectured, whence is subdivided and contextualized to derive information, whence is subdivided and contextualized to derive data. 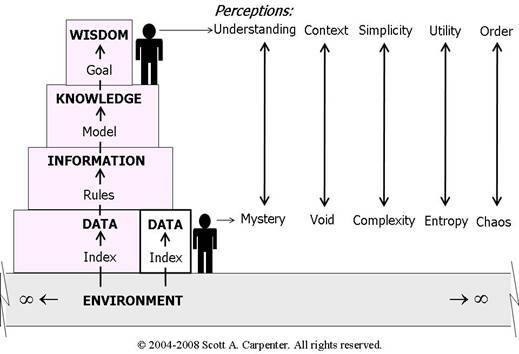 Carpenter and Cannady  proposed a HoU that conjectures context downward (values, goals, models, rules, and index) followed by context-validation upward in which content (numbers) is transformed by each layer of context into data, information, knowledge, and wisdom. Figure 1. Interpretation and comparison of five Hierarchies of Understanding (HoU). The Cleveland, Ackoff, Bellinger, and Tuomi models [1-4] imply a limit to human cognitive ability. Ackoff  went further to posit that about 40% of cognition allocates to the data layer, 30% to the information layer, 20% to the knowledge layer, and only 10% remains for higher layers. Ackoff called this distribution the “allocation of mental space” (see Figure 2). Figure 2. Allocation of Mental Space (an interpretation of Ackoff ). Figure 3 is a conceptual representation of the professional-novice cognitive divide; a communication divide caused by the wide gap in subject-matter understanding between expert and non-expert. From the expert’s perspective, the subject matter under discussion is relatively simple, understandable, contextual, useful, and organized. But the student, familiar with only a few pieces of subject-related data, finds the subject matter mysterious, disconnected, complex, unusable, and disordered. It may take the student years of study to achieve expert-level understanding. Figure 3. Relativity in Understanding; the Professional-Novice Divide. Our present culture classifies humans and technology as separate entities. But Clark  argues that we can not disambiguate ourselves from our technology; that information technology is an extension of mind; that we are seamless cybernetic organisms. Thus, Clark sees no a priori limit to our cognitive ability because it expands with technology; the mind is just less and less in the body. Carpenter and Cannady  also take this view – that humans develop computing technology and computing technology amplifies human cognition. The two iteratively amplify each other. Figure 4 shows two individuals and their respective triangular- and diamond-shaped representations of their allocation of mental spaces. The individual standing at the bottom is without technology; and the allocation of their mental space is dominated by low-level cognitive processes, such as data processing, and the Ackoff-like triangularly-shaped allocation of mental space is the result. 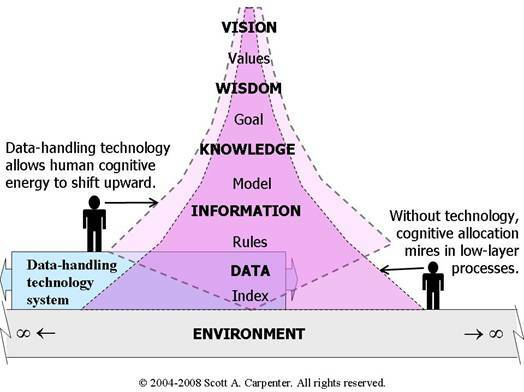 In contrast, the other individual applies data-handling technology to free-up some of their mental space which is then applied to higher layers of cognition; their allocation of mental space is a diamond-shaped distribution among the cognitive layers of data, information, knowledge, wisdom, and vision. Figure 4. Semantic technology up-shifts allocation of mental space. Figure 5 extends the trend in cognitive up-shift by considering near-term semantic technology [7, 8] that processes information and knowledge with the same ease as numbers are processed today. Our culture may come to view information and knowledge as mundane and as boring as data is today. Humans may find greater interest in goal-setting, decision-making, value-setting, and strategy (all efforts to turn vision into reality). 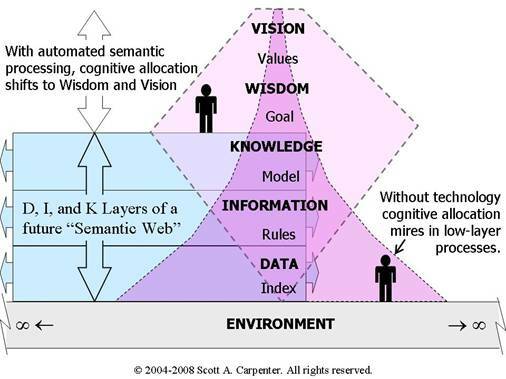 Ackoff’s prediction  that most of our cognitive energy goes to the data and information layers is turned upside down in this new top-down paradigm enabled by semantic technology. Figure 5. Semantic Technology up-shifts allocation of mental space. Cleveland, H. Information as a Resource. The Futurist, December (1982), 34-39. Ackoff, R. From Data to Wisdom. Journal of Applied Systems Analysis, 16 (1989), 3-9. Tuomi, I. Data is More than Knowledge: Implications of the Reversed Knowledge Hierarchy for Knowledge Management and Organizational Memory. Journal of Management Information Systems, 16(3) (Winter 1999-2000), 103-17. Carpenter, S. A. and Cannady, J. Tool for Sharing and Assessing Models of Fusion-Based Space Transportation Systems. Proceedings of the 40th AIAA/ASME/SAE/ASEE Joint Propulsion Conference and Exhibit, (July 11-14, 2004), Fort Lauderdale, Florida. Clark, A. Natural-Born Cyborgs: Minds, Technologies, and the Future of Human Intelligence. United Kingdom: Oxford University Press, 2003. Berners-Lee, T.; Hendler, J.; and Lassila, O. The Semantic Web. Scientific American, May 2001. Shadbolt, N.; Berners-Lee, T.; and Hall, W. The Semantic Web Revisited. IEEE Intelligent Systems, 21(3), 96-101, May/June 2006. Grant, R. M. Toward a Knowledge-Based Theory of the Firm. Strategic Management Journal, 17 (Winter Special Issue 1996), 109-21. Viereck, G. S. What Life Means to Einstein: An Interview by George Sylvester Viereck. The Saturday Evening Post, (October 26, 1929 issue).